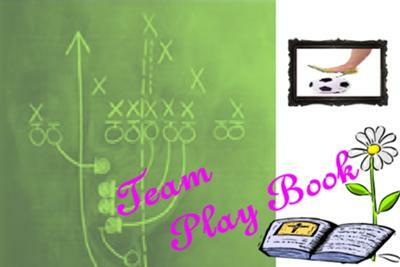 Print the Team Play Book Cover & Glue onto the front of your binder. Print the Team Play Book Cover Sheet & Place in Sheet Protector and then use this as the first page of your binder. You should also print out your Laundry Plan Weekly List. Print out 2! Tack one up in your Laundry Room so the whole family knows the Laundry Schedule. A Load a Day keeps Mt Pile of Dirty Laundry Away! Print 2 Daily Schedules. One to place in a sheet protector (it becomes like a dry erase board) and place on your Refrigerator or near your calendar. The other one can be placed in your Team Play Book. Whereas Family deals with all of the people within the house. Master Store List - This one you may edit by placing it in the order of your favorite store. I use this as I use my Grocery List, labeling only the aisles I will be needing to visit. This Master Store List is a great mental check off at home if I need anything. Menu Planner/ Grocery List - You do not need to place a hole in this one, in fact print a few and place in the back pocket of your binder so you will have them ready each week as you plan your monthly meals. Wow, thanks so much Jeanie for these detailed instructions. It sounds like you have a great plan. I really like how the notebook encompasses many areas of our lives. Not just the household chores, but also including our spiritual lives and family fun. So, does anyone else want to explain how they create their household notebook? If so, share how you made your household notebook here, or read how others have created their homemaking notebooks here.